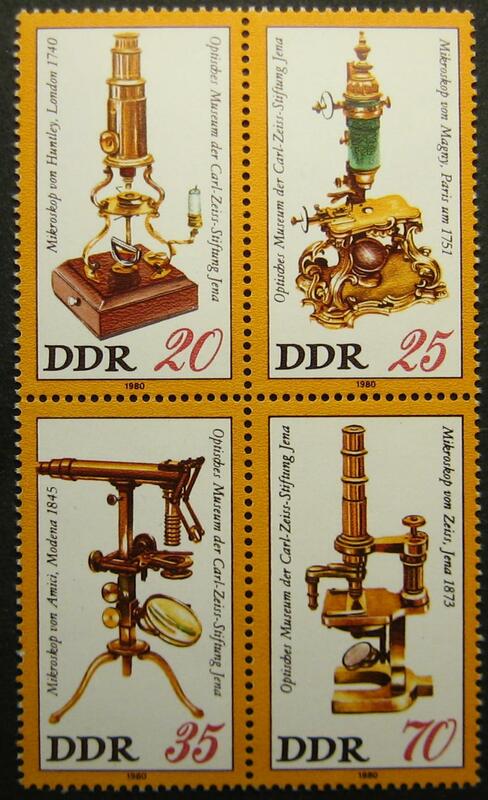 These postage stamps were released in Germany depicting four antique microscopes. At the time, advancements in microscopy were essential to the early study and understanding of infectious diseases. The stamps are marked DDR (Deutsche Demokratische Republik), formerly known as East Germany. Microscopes are still used today to study infectious (or contagious) diseases. The biological microscopes used today are a bit more advanced than the antique microscopes, but have some of the same features. One major change from antique microscopes to modern microscopes, is the use of an illuminator rather than a mirror for illuminating the specimen. 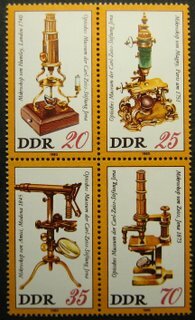 If you are looking for a microscope for viewing stamps, these microscopes are good places to start. Viewing stamps through a microscope is best performed with a stereo or low powered microscope.